Pre-heat oven to 175°C / 347°F. Use rack that is third from the top. Separate the egg whites into a medium bowl, and save the yolks for something else. Stir in the vanilla and three tablespoons of the milk. Whisk until just combined. In mixer with flat beater attachment, add: cake flour, white sugar, and baking powder. Beat on Low for 30 seconds. Add butter and remaining milk. Beat on Low until combined, and then beat on Medium for 90 seconds. Add half the egg white mixture and continue on Medium speed for 30 seconds. Add the remaining egg white mixture, beat for an additional 30 seconds. Spoon into muffin tins. Bake 14 minutes. Cool in pan for 1 minute, before transferring to cooling rack for at least one hour before frosting. 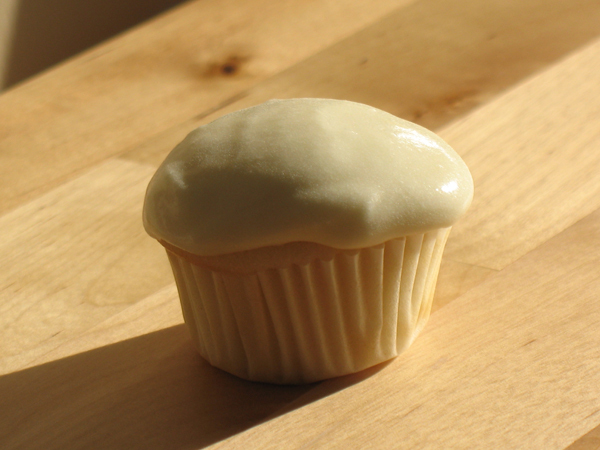 Make your frosting by combining the cream cheese, butter, milk, lemon juice, and vanilla. Beat well, and add the icing sugar one cup at a time. Beat until smooth. Cut back the amount of milk and lemon juice to achieve firmer frosting.